I hope everyone had a great Easter weekend. This past Saturday my Chicken Adobo made it Top 9 dish on Foodbuzz. To me and my husband, it was really like winning the lottery because we didn’t expected it at all. I would like to thank all my readers for visiting my site. I’ve been working hard for my website and I really appreciate your time here. And for those of you who found me through the Foodbuzz Top 9 link, welcome! I am sincerely happy if you enjoy my website and recipes. Now let’s talk about today’s recipe. In my previous post (just below), I talked about this great sauce called Shiso Garlic Soy Sauce. 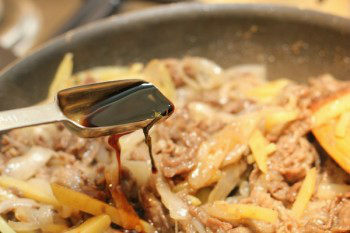 Today’s recipe is a Beef Donburi using this sauce. In my previous post, I talked about this great sauce called Shiso Garlic Soy Sauce. 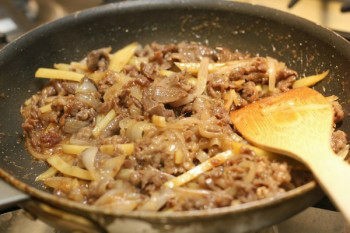 Today's recipe is a Beef Donburi using this sauce. Cut the meat into strips. Slice onion and shiitake mushrooms thinly. 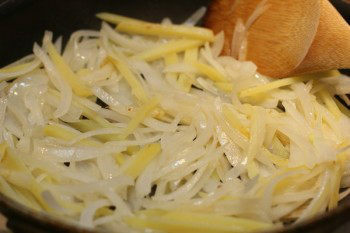 Cut potato into thin strips. In a medium bowl, combine seasonings and mix well. 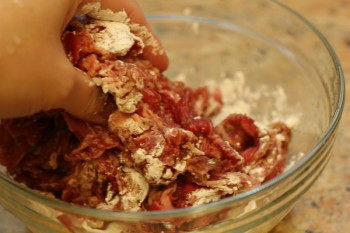 In the medium bowl, add meat and mix well with hands. Sprinkle corn starch and mix with hands again. In a non-stick frying pan heat oil on medium high heat. Corn starch will easily stick to the pan, so I would recommend using non-stick frying pan. Add the onion and potato and cook until they are soft. 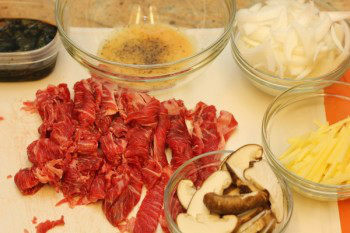 Add the meat and shiitake mushrooms in the pan and cook thoroughly until the meat is done (*shiitake is missing from the picture below). Add sugar and Shiso Garlic Soy Sauce and mix all together. Cook for a few minutes. 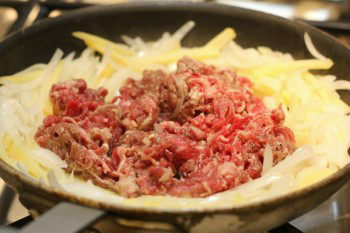 Put rice in a donburi bowl and serve the beef on top of the rice. Take out shiso from the container and cut into thin strips. Put them on top of the beef and serve immediately. 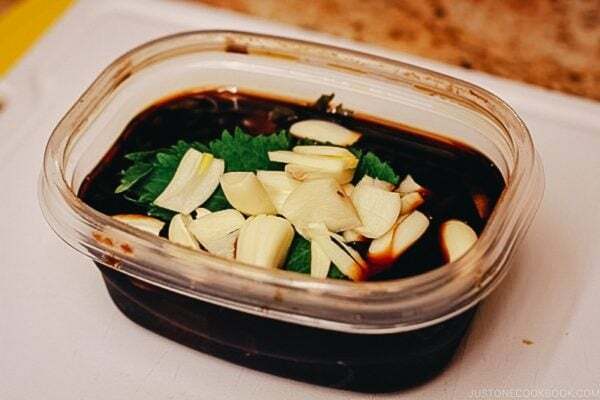 Shiso Garlic Soy Sauce: Homemade recipe, click here. Thanks for stopping by my blog Nami – I too love YOUR blog! I often don’t have time to get decent pics of dinner with 2 young kiddos at my feet while I’m cooking but I appreciate good wholesome recipes like you dish up. I’m so happy you had such a great response to your last post. Congrats again! 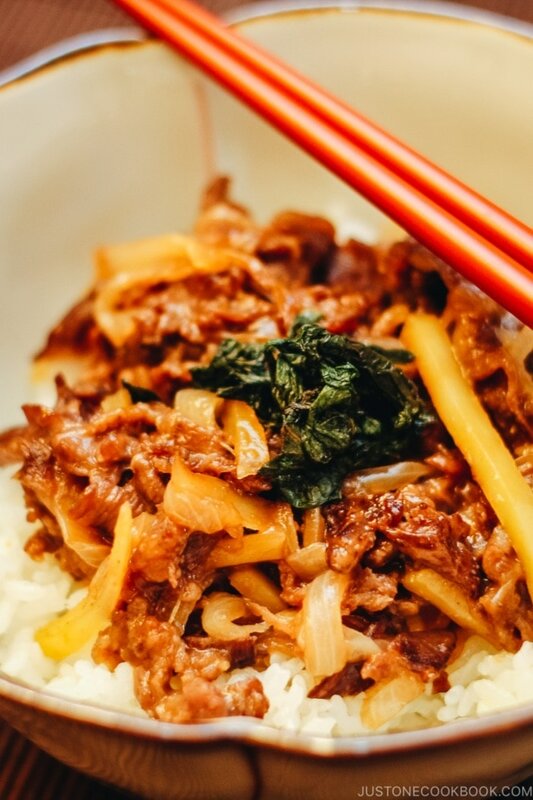 What a lovely bowl of Beef Donburi. I can have this for lunch and dinner. No side dish required. Oh this looks and sounds very very delicious! I am making something similar all the time..just never tried adding potatoes. I love it!!! Hi Sandra! I love potatoes…and when I get a chance I’d add potatoes. But my Chinese husband thinks it’s strange that potatoes are in there. We always talk about why Japanese like potatoes so much vs why Chinese don’t like potatoes. It’s endless conversation we always have. Yum, I need to get meat for this and make the shiso garlic soy sauce 🙂 Can’t wait to try it! Hi Suzana! Your chicken adobo was AWESOME! It’s been a chain reaction going on between us. It all started from your crepe. I want to bake the buns you just posted but afraid of my daughter picking raisins and not eating the rest. #2 kid is very hard to reason! LOL. Hahahah it goes with being a girl first LOL I know, I have one 😉 and trust me it can’t be worst with number 2 as is with an only child and a spoiled one at that ROFL! 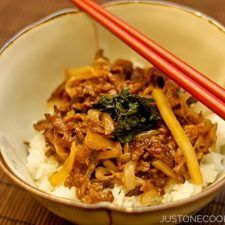 Hi Nami, your blog has so much interesting information about Asian cooking, I am thinking I could substitute your beef (which I don’t eat) with chicken – do you think that would work? (… I would consider myself still illiterate about Asian cooking, although there are many dishes I love to eat, with the exceptions of chow mein and fried rice, I have never successfully cooked an Asian meal to my satisfaction). Hi Chris! Of course you can substitute with Chicken. 🙂 It’s like me who’s trying to bake. I don’t really bake sweets so I’m a bit hesitant to start. I can only bake very basic things…that doesn’t include cupcakes! I hope I can introduce some Japanese dishes that you might be interested in. Thanks for your visit Chris! I just want to sit in your kitchen when you make all of your meals… I bet it smells SO good!!! the sauce and this dish sounds so easy and delicious! 大葉にんにく醤油 is the name and you still might hear about it in Japan. I love these dishes you have been posting…they all look so great. This has my mouth watering, especially with that garlic soy. Yum! Congrats on getting in the Top 9 with the other dish, too! This dish looks so tasty! I love all the flavors especially the garlic soy sauce. YUM! Thanks Kara! Yep garlic and soy sauce… delicious! As I sit here in my kitchen trying to figure out what to make for dinner, I wish instead that I had a big bowl of this donburi. It would make me happy, yes, it would! Yum yum! Hi Jean! Hahahaha. This is an easy and fast dish to cook, but yes, we needed to prepare for the sauce… Thanks for coming by! Woo-hoo and more Congratulations to you! Your recipes and pictures are so great you deserve to be recognized! This sauce is a perfect example of why. Hi Sandra! Thank you for your compliments. 🙂 On the other hand I can’t even bake cupcakes and don’t even know how to make frosting…..hopeless? Nami, I don’t know how you have time to write this wonderful blog with those little ones! You are amazing! I’m loving this dish, the sauce sounds fantastic and I can see this one being a family pleaser to my entire family. Congrats on the Top 9, I saw the dish up there and it was beautiful! This recipe even minus the mushrooms looks outstanding. Thank you so much for your kind words Mandy! Hi Aipi! Thank you so much! I’m learning a lot from your website too! Hi Nami! 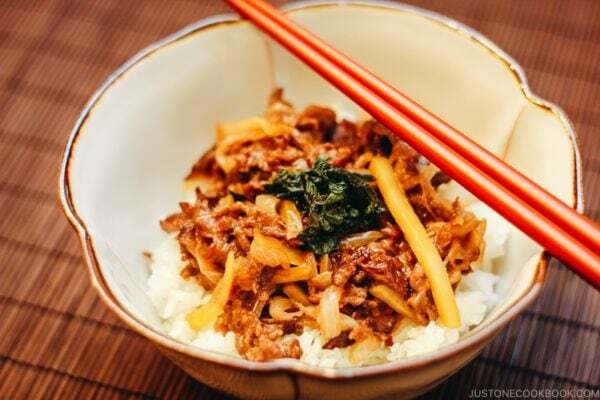 Thanks for dropping by my blog earlier – I love donburi and one-dish-meals are always winners in my books 😀 Congrats on making to the Top 9 too! Hi Jen! Thank you so much! Yes, me too I love one dish meal and I saw a lot on your site already. Hehhee. It’s so great to have found your blog because now I will know how to cook Japanese at home. Such wonderful recipes, Nami! Morning Carolyn! Thank you for your nice words. Same here, I get to learn all kinds of baking from you! This sounds great! My son is a picky eater but loves Japanese food. This is definitely something he would like. Mary, thanks for letting me know – I don’t use Google Friend Connect and I couldn’t find your facebook page (you prob have an account only). It’s okay, I just signed up to subscribe via email. Thank you so much Mary! Hi Nami! This is my first visit to you site and I am so impressed. This will be a wonderful resource for Japanese cooking. I like how clear your recipes are and the extensive photos are so helpful. Thanks for stopping by my blog and I promise to come back and visit to see what you are cooking! Oh my, that is one delicious dish! Beef with shiitake mushrooms…and then that sauce!! YUM! Beautiful job! Thank you Kate for visiting my site! Anything with garlic, I m in.This looks so perfect for a quick dish.I do not eat beef but would love to try this with chicken.I love the simple flavors here. Congrats again on the Foodbuzz#9.I m so glad to have found your blog! Hi Tanvi! Haha you are a garlic lover. Sure chicken will be good too. It’s really amazing what we can cook with such simple flavors. Thanks Tanvi! Hi Nami-Did check out your blog, just like I mentioned on foodbuzz! Love this comforting and delicious this, as some of the previous ones. Will browse through some more to spend more time on those amazing dishes, and sauces you make! Love your blog…come by and visit my blog, as well! Hi Juliana! You PLANTED shiso! How envious! Deers come to my backyard and so do all kinds of animals, so we can’t plant anything. We have cactus now… Enjoy using shiso for your cooking! This looks really good. I love how clear your instructions are too. Its brilliant that you’ve added pictures so that people following the recipie can see if what they’re cooking looks the same as what the expert has cooked! I love this recipe and I think your blog is great. I must bookmark you right now. Thank you Bizzy for stopping by! I hope you find some recipes you like here. Woohoo!! Congratulations – this one is another winner! i have not been able to find shiso leaves here. is there something i could substitute? do they have a powdered shiso? thank you and Happy 2013! Hi I had a question about the meat. Last time I went to a Japanese supermarket I remember seeing shabu shabu meat. I thought I remember it being pretty expensive how much is a regular package generally cost? Is this package you’re referring to a basic pound or much,much less? Please help me! Thanks. Hi Katie! It usually costs around $7-8/lb. You can use “Komagire” (scraps) for this donburi too, which is cheaper. Another option is to freeze the meat and thinly slice yourself. After trying your yakisoba on Sunday, I just had to try this dish tonight. Another success! My husband loved it. 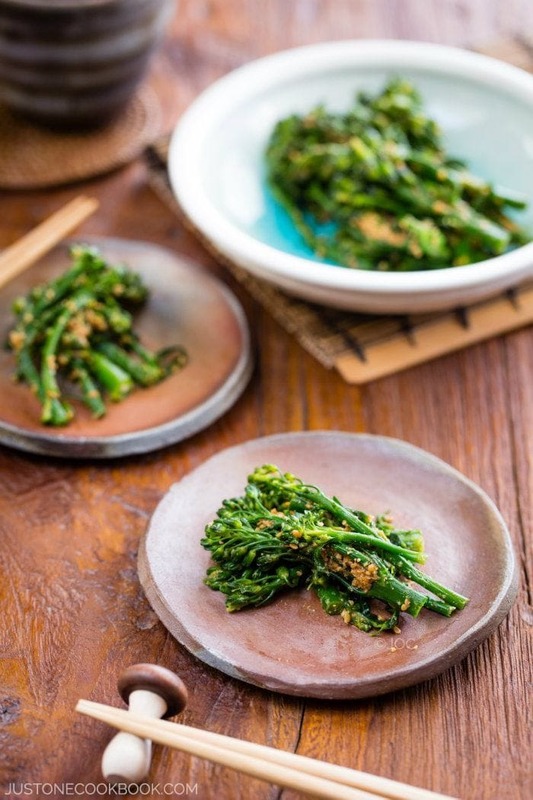 The shiso garlic soy sauce is amazing – can’t wait to use it in lots of other dishes. 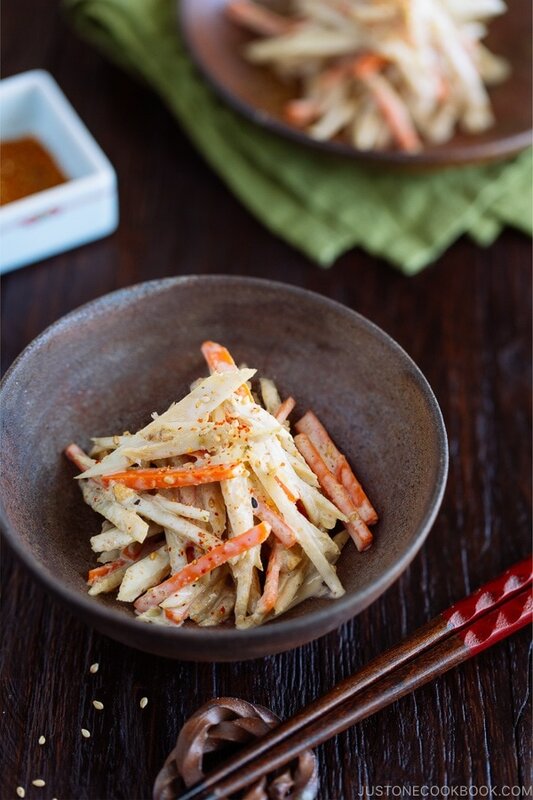 I also made your pickled daikon, as I had some leftover from another recipe. Thanks so much! It looks awesome! I think my husband would love this. About how many grams of meat is in a package? It looks like a lot in the picture. Take out shiso from container and cut into thin strips??? I don’t understand, I thought shiso is garlic sauce? Hi Nagi! Shiso (Perilla) that you soaked in the Shiso Garlic Soy Sauce. 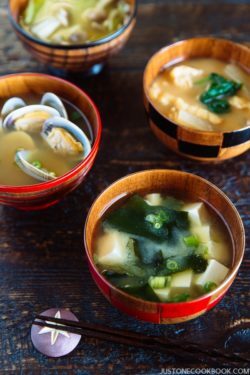 🙂 The container should have 3 ingredients – shiso, garlic, and soy sauce (https://www.justonecookbook.com/recipes/shiso-garlic-soy-sauce/). I use the shiso in the garlic soy sauce to put on top of donburi. 🙂 Hope this makes sense. When should the seasonings be added? Hi Wywy! In step 1, you add all the ingredients for seasonings in the medium size bowl and mix well. 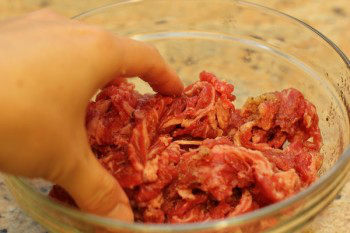 In step 2, you add the meat into that bowl to marinade. 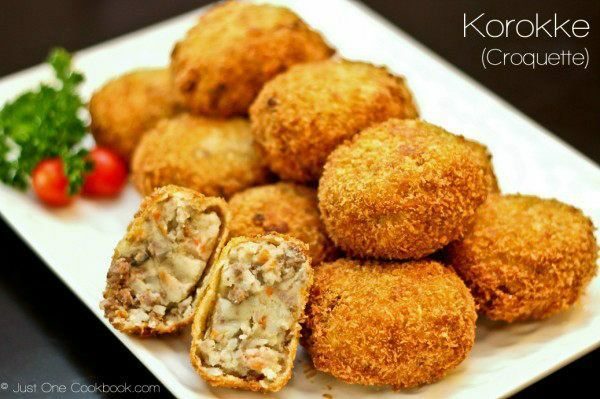 I have just seen this recipe on the FB page. 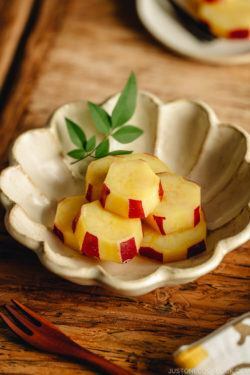 Look so delicious and would be soooo yummy with Shiso. Shiso is my favourite and I think it is the world best garnish. can you use anything as a substitute for the shiso. and what would you recommend as a garnish for this dish to make it look more colorful? Hi Nami..I can’t find shiso leaves here. What can I use to substitute? Normal soy sauce? Yum, this look delicious. I have zero experience cooking Japanese food, but it is hands down my favorite type of food to eat. I recently subscribed to your website and am excited to start trying some of these recipes. Thanks! Goniziwa , I made this last night and it was so good ! Obviously I omitted shiso leaves since i can’t find here in Italia, still came out good and it’s a brilliant idea to add potatoes which I never thought about it. you probably notice that I’m Korean “hence my last name & first name” we often stir-fry onions and Potatoes like this very common dish for breakfast whenever I see your recipes & go to Japan there are lots of similarities yet so different ! Anyways thanks for the good one ! Glad you liked the potato idea. 🙂 I know, we have so many similarities but a bit different. I LOOOOOOOOOOOOOOVE Korean food too. With my tolerance for spice went up, I could enjoy way more Koran foods. 🙂 Thank you for your kind note!